Looking for something amazing? The Birdsong Lodge is just the place for you. This 5000 sf lodge style home is a spacious and fantastic 2 level home located just south of Leland on 300' of magical Lake Michigan. You cannot beat the view of Lake Michigan with massive windows everywhere in this house. On a quiet private street this is the place to kick back and relax.This home sleeps up to 14. This beautiful home and location welcomes you to one dreamy vacation. On the main level are 2 bedrooms, one with a King and one with 2 Twins with private bath. Sofa bed in the family room. On the upper level there is an open-concept master bedroom with 1 King bed with full bath, second bedroom has 1 Queen bed with separate balcony overlooking the lake, the third bedroom has 1 Queen and fourth bedroom has two twins. There is a additional bathroom on the upper level. Mid-stay linen change for 7 night stays or more prime summer. These fun accommodations offer a huge living room featuring high ceilings and natural tile floors.Impressive stone wood fireplace and spectacular Lake Michigan views are a special treat. Cozy family room off of the living room that offers TV viewing. Cable TV and Wifi provided. Dining room that seats 14 at the dinner table. This area also is tiled and makes for a perfect dining area. Full updated kitchen with dishwasher. Washer/dryer in separate location. Outdoors is the place you will want to be. Watching the waves lap on the shore, spectacular sunsets, and a huge yard if you are into playing yard games and such. There is a basketball net on the paved driveway so make sure to bring your ball with. Lots of outdoor seating on the spacious decks. There is also plenty of seating near the shoreline as well as a fire pit. Gas and charcoal grills on a stone patio for barbecues. Petosky stones often find themselves on this beach too. A rock collectors paradise. Such a bonus! This is located about 5 minutes from the village of Leland. Known for "Fishtown," this community is rich in history and a must-see attraction. Plenty of shops and dining. The marina on Lake Michigan is beautiful. Houdek Dunes is a few miles out of town on the way to Northport for hiking and enjoying nature. Easy drives to the Leelanau State Park to the north or Sleeping Bear Dunes to the south. You can do lots of wine tasting here. Good Harbor winery is 1/4 of a mile from the house. You will never run out of wine! Needless to say, there is so much to do in this great area! Make a visit to this location soon. Sheets and towels provided. Sorry, no pets. This is a Saturday - Saturday rental for prime summer weeks. Short stays available in off peak seasons. Memorial and Labor Day weekends require three nights. We absolutely loved the home and views! Weather was cold and extremely windy so we were unable to sit outside which was unfortunate because they have a great deck and area by the water. There were no instructions on how to operate the tv so we were unable to use it. We tried everything too! We did use the fireplace. The home was pretty smoky even with the flute open. I think it&#x2019;s time to get a chimney sweep in there. But besides these things the house was great for our group of 13 ladies. We had a fabulous time! We sure have a beautiful State! We are glad you enjoyed your visit despite a couple of issues. We will make sure to get instructions for the TV posted. The chimney was inspected and cleaned Nov 2018. This property is everything we could have wished for. Six couples stayed here for a week and had a wonderful time. The house was immaculate upon our arrival, and we were even offered midweek change of all bedding and linens. The views and amazing sunsets were to die for. This is one special place. Glad you had the opportunity to stay in this amazing home. My husband just said to me that the house exceeded his expectations. 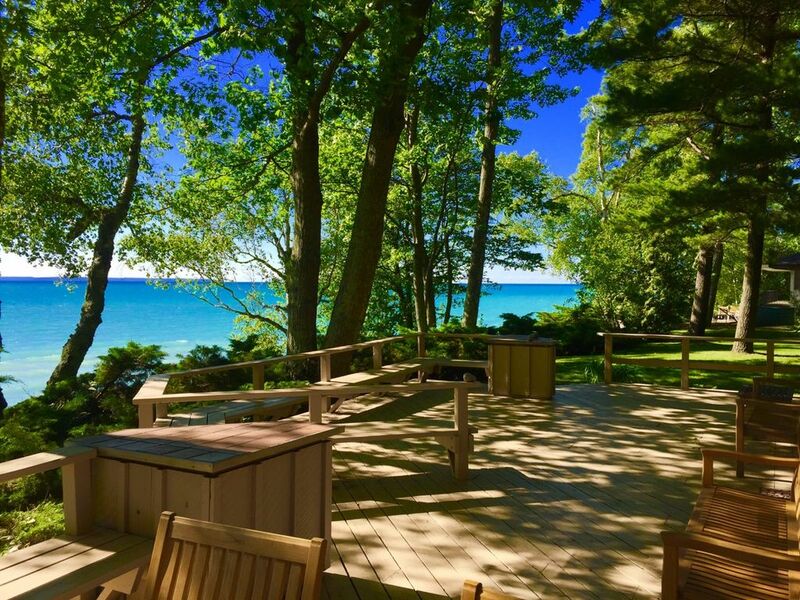 It was spacious, clean, nicely outfitted, beautifully situated on Lake Michigan and close to both Leland and Glen Arbor. Our grandsons loved discovering all the decks, hammock and lakefront... so many special places on the property. The beds were comfortable and all the rooms were good size. There are a few things that could be improved, however. — The stove was a little quirky and the edge by the door seemed dangerous with little ones about — The lower lawn by the lake would have been more appealing if it had been freshly mowed... it was all white clover and bugs — The deck was badly in need of repainting/staining — The great room needs more light. It was hard to read or play games there in the evening. — The sink was totally flat without a grade to the drain and no disposal, so it was hard to clean — The fire we built in the big fireplace created a smell throughout the house even though the flu was open. — The whole house fan didn’t work which was sorely needed the first very humid night of our stay — We couldn’t figure out the landscaoe lights to the lower lawn All in all, though, it’s a wonderful find for a Great Lake Vacation and we’d recommend it to any big family or group of friends! Thank you so much for staying at Birdsong.The property is mowed on a weekly basis. Deck upgrades are being considered spring 2019. More lamps were added to the great room. The chimney is serviced each year and it was cleaned and inspected in 2018. Not sure what happened with the flue. The whole house fan is not advertised but we will look into upgrading that if possible. We will mark the switch for the exterior lights. They should have gone on automatically. Our family reunion was spent at Birdsong Lodge. We had 14 people from five states arrive for a week. Plenty of room and wonderful weather. Lots of things to do, Sleeping Bear sand dunes, kayaking nearby, trips to Mackinaw Island, Leland/Fishtown, Suttons Bay. The view is amazing and we found a lot of Petosky stones in the water. We had a few issues like one of the toilets leaking. The management sent a plumber out the same day to repair it. The housekeeping staff could use some retraining - they did not leave sheets for the sofa bed. When I called, management sent someone out with the sheets, which we needed. Housekeeping also left us only ONE dishtowel and NO dishcloths. Luckily my daughter had some with her so we used hers. I would recommend more than two garbage cans for a property which accommodates 14 people. There is not enough room for a week's worth of garbage bags in 2 cans. We did have a good time and management was most helpful when we had issues. We apologize that things came up missing. Typically the upper level closet is well stocked with extra linens. We do have garbage service that picks up the trash at the house mid stay. There are sufficient cans at the property. (5) Perhaps they were moved to another location on the property? We had a party of 11 in the area for the Toast of the Season winery tour. The space was absolutely beautiful with plenty of room to meet our needs. Lots of space to be together, but plenty or areas to grab some time alone. There were a couple small things that probably had not been reported to the maintenance crew (broken dishwasher arm and small damper issue). We has Friday dinner at The local Fisher's Happy Hour Tavern (which was terrific) and Saturday dinner at Georgina's in Traverse City (a family favorite) which was about 25 minutes away and absolutely fabulous. The views from the property are stunning and it's one of the most gorgeous places in all of the peninsula. Highly recommended. Thank you for staying with us again. We are working on more improvements for 2018. The kitchen has had many more items added including a new fridge and stove too.